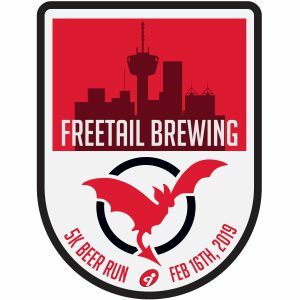 Freetail Brewing 5k Beer Run – Saturday, February 16th! Join us for the THIRD annual Freetail Brewing 5k Beer Run on Saturday, February 16th! • A great story to tell your sorry friends who didn’t join you! Freetail Brewing 5k Beer Run is on Saturday, February 16th at San Antonio’s favorite craft brewery! Traditional 5k beer runs have you run a full 5k and then head into a taproom for a pint. They make you wait to enjoy your beer until the end of the race. Not us! You get to enjoy awesome craft beer DURING THE RACE, out on the race course! We will start off the Freetail Brewing 5k Beer Run with a celebratory “Cheers!”, giving you your first sample of the day and signaling the beginning of the race. Our looped courses will have you drink a total of 5 beer samples. Try a different beer each lap, or just stick to your favorites. Once you complete the 5k beer run, your finisher’s award is a limited edition, custom event pint glass with the brewery and event logo. Take it into the taproom for a free pint of your choice. Root Beer Division The Freetail Brewing 5k Beer Run is a family friendly event! We have a Root Beer division for our under 21 participants, designated drivers and non-beer drinkers. Root Beer division participants will receive all of the same swag as Beer Run participants, but will have root beer and water available on the course and in the taproom to enjoy as well. This FUN and SOCIAL 5k beer run starts at 2pm. Sprint, jog, walk or crawl. This event is not chipped time. Bring your friends and family out to share this fun experience with you! The Beer: Freetail Brewing has some AMAZING beer! The beer we will have during the 5k beer run includes: Bat Outta Helles, Soul Doubt IPA, Conserveza, TexiCali Brown Ale and San Antonio Pale Ale. Something for everyone! The Root Beer: Since the Freetail Brewing 5k Beer Run is family friendly, we have the Root Beer Division as well! We will have water and root beer on the race course and craft root beer for the finishers of the Root Beer Run. Finishers will receive the same custom race event pint glass as a Finisher’s Award. Previous: Previous post: What a fun event! – Scavenger Hunt Beer Run!